In Part One of our interview with THE BAY'S Mary Beth Evans, she discussed her journey of joining THE BAY as a producer and actress, as well as her years on RITUALS, and getting hired on DAYS OF OUR LIVES. In Part Two below, we discuss the phenomenon of Steve & Kayla, the downfall of Shane & Kayla, and her time as ill-defined Katherine on GENERAL HOSPITAL. WE LOVE SOAPS TV: That time of Steve & Kayla is still regarded as such a special time in soap history. What in your mind makes that story so special to this day? Mary Beth Evans: I was just talking to Shelly Henning [Stephanie on DAYS] about this the other day. She was saying she had gone onto You Tube to look at something and came across those clips. She said, “You guys were just so amazing, there is nothing like that anymore.” I think there a couple of things about that. My character was strong, but she was so young and naive. Steve was a badboy, but the thing that was cool about him was that he had this incredible vulnerability. That sweetness with his rough exterior was a great combo. Now I’m not like this, but people like to rescue the badboy. That appealed to people. He had this incredible heart underneath it. He would cry, he was vulnerable. They were connected to that. Plus when they wrote it, they worked on the super couple concept. They would take time to come in and add a sheer curtain or some candles and some wind or something. They would go out of their way to make the romantic scenes visually special, and they would bring it to the table. And we rehearsed it. We would go through the show four times before we even shot it. Now you go through one take and it’s good-bye. It’s a different beat now. Stephen and I really connected as friends, and really trusted each other. And we were just lucky. I don’t think that can ever be repeated. We both feel that way. WE LOVE SOAPS TV: Do you think having rehearsal time made a difference in terms of how fans viewers connected to Steve and Kayla? Mary Beth Evans: Yes and no. I know that all of us now just have to do it on our own. But then the producers would come in and change things up, even if it took an hour to add the curtains, add the candles, add the wind, or whatever. They took the time to do it. And that’s what doesn’t happen anymore. They don’t have the time, they don’t have budget. It’s amazing what they are able to pull off. They do so much now, and they are out of there by 5pm. They have to or it won’t be on the air. WE LOVE SOAPS TV: And younger actors don’t really have the time to be nurtured or mentored in their craft. They just have to sink or swim. Mary Beth Evans: If you don’t have good instincts, you’re not going to last. It’s what you bring to the table. You might get a note, but it’s mainly just what you bring. WE LOVE SOAPS TV: I think one thing that really resonated was how Steve and Kayla became symbols for the power of love and forgiveness, and for “sweetness” and light to transform anger and darkness. Mary Beth Evans: One of my favorite scenes ever is when she goes to his basement apartment, and Steve had been beaten up. She tries to clean him up and in order to that she has to take the patch off. I mean my God, she’s seeing the gooball, or minus the gooball. It’s just amazing. Of course when I see it now, with the acrylic nails or the country western hair, I would be like [makes a screaming sound]. But the concept was beautiful. He could be like a wounded animal so easily. And the trust that was there was beautiful. WE LOVE SOAPS TV: One of the things I love about daytime is how it shows characters overcome adversity year after year. When it comes to tragic heroines, Kayla Brady has been thrown more than most. Mary Beth Evans: (Laughs). It started at RITUALS when I was thrown a brain tumor while I was a virgin, a surrogate mother, while roller skating and eating an ice cream cone. The list was so ridiculous, I felt like I needed to make a poster or something. WE LOVE SOAPS TV: Then on DAYS Kayla was attacked numerous times, she was raped, she was deaf, she was mute, she always being kidnapped. Why do these stories kept being given to you? Mary Beth Evans: I don’t know, they happen to whoever is the heroine. These stories are hard to write year after year. They have to come up with stuff like that. No one thinks that real life is that exciting. How many times have I been kidnapped in my real life? Zero. How many times has my child been missing? Zero. WE LOVE SOAPS TV: Any DAYS fan from the 80s will tell you that one of their most favorite moment in history is Steve and Kayla’s wedding. For months Kayla had been deaf and mute after being traumatized. You did such great work with your eyes during those months. You had to convey so much without speaking. Mary Beth Evans: Thank you. We had a sign language teacher come in and we worked really hard at signing. I got really involved at the time with raising money for deaf schools. We got immersed in the whole thing. It was a great story. On that wedding day we were on that ship. You don’t realize it as a viewer, but they were using huge carbon lights. They were so bright, I could barely keep my eyes open. Stephen and I to this day adore those characters, invest in those characters, want the best in those characters. We got wrapped up and swept away by the story too. That’s part of why it worked so well too. 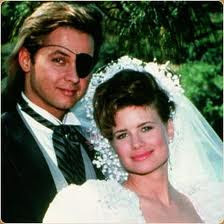 WE LOVE SOAPS TV: That wedding is one of DAYS highest rated episodes ever. Mary Beth Evans: I think it was the only time the show had been number one in the ratings. It was big. WE LOVE SOAPS TV: How did you approach such a big moment, knowing that this was such a culmination of such an important story for so many viewers? Mary Beth Evans: We never think of it that way. We are just thinking about memorizing our stuff, trying to connect, trying to stay honest, and good-bye. Mary Beth Evans: It’s so funny. Now that Charlie is on THE BAY, we just did an interview where Charlie and I were talking about the absurdity of all that. We had been two parts of big couples. And those two parts left. We were just there, and they said, “Okay, we’ll throw those two parts together.” I really fought that. I felt like Steve was the love of her life, and he died. And then they write it so that she doesn’t even go to his grave, she goes to Shane’s house and hooks up with him. We both thought it was ridiculous. That actually ended up being part of my downfall on the show. I was re-singing with the show and I really wanted to know that they were going to stay true to my character and not do stuff like that. I was so idealistic at the time. During the course of that negotiation there was a huge changeover in who was running the ship, and everything just fell apart. I love Charlie with all my heart, but I knew that wasn’t right, he knew that wasn’t right. We fought it, but what are you going to do? When you get those scripts you’ve got to do what they tell you. WE LOVE SOAPS TV: After you left DAYS you gave an interview in which you thought of leaving DAYS like leaving a boyfriend. You know it has to end, but you don’t want the other person to be the one to end it first. Mary Beth Evans: I really loved DAYS. There was a weird transition of power and things fell apart. I was really surprised. I would have stayed there forever. But I have found that with all the things that have happened, including GENERAL HOSPITAL throwing me off the balcony two years in a row, all these things have opened great avenues for me. If I hadn’t left DAYS I wouldn’t have gone to GENERAL HOSPITAL and met that whole slew of people. It’s all been good. Someone just sent me some pictures from the Nurse’s Ball on GH. All those dance numbers I would do with Lynn Herring. I can’t sing at all, but they always had me to do something, it was fun. WE LOVE SOAPS TV: You have written blog posts and talked a lot about change being good. As you said, if you had stayed at DAYS we never would have met your portrayal as Katherine on GH. That gave you a chance to flex some different kind of acting muscles. Mary Beth Evans: That was very different for me. I don’t think I ever loved being the bad person. Plus I never understood why she was bad, we never really covered that. Then they would do oddball things like have Stephen come. We’d be romancing, and then I would be his sister! But with a lot of these shows it depends on who is writing. Someone new comes, they take it a different way, and it takes a big turn. They were all good experiences, but I really missed DAYS, and I really wanted to go back. I always wanted to go back. I just felt it was home. EDITOR'S NOTE: Press here for Part Three in which Mary Beth talks about her role as Sierra on AS THE WORLD TURNS, and her not-so-spectacular return to DAYS. What happened to Steve & Kayla the second time in around in Salem? Come back to find out! I enjoyed reading Mary Beth's take on what makes a supercouple. It's sad that Days does not even make any attempt to make a new one true paring anymore. A lot of people on the Days boards want romance not hook ups.